In the 2015 EU action plan for the circular economy 1 the Commission announced the development of a monitoring framework for the circular economy. The framework aims to measure progress and to assess the effectiveness of action towards the circular economy in the EU and Member States. To this end, and building on existing data, a set of meaningful indicators were identified to cover the different phases of the circular economy. The framework is a key tool to show if the existing policy initiatives are successful in delivering the expected results and it allows identifying areas where more action is needed. This document lays out the methodology used for selecting the indicators and includes an analytical description for each of them. A summary of the consultations of the Member States and stakeholders is also included. Section 3 provides the key metadata (data source, use in Commission documents, web links) for each indicator. The underlying data populating the various indicators provide a snapshot of what we know today 2 . To ensure regular reporting on circular economy, Eurostat will regularly update the monitoring framework on circular economy on its website 3 . Due to the cross-cutting nature of the circular economy, measuring progress towards its achievement requires a multi-faceted approach. 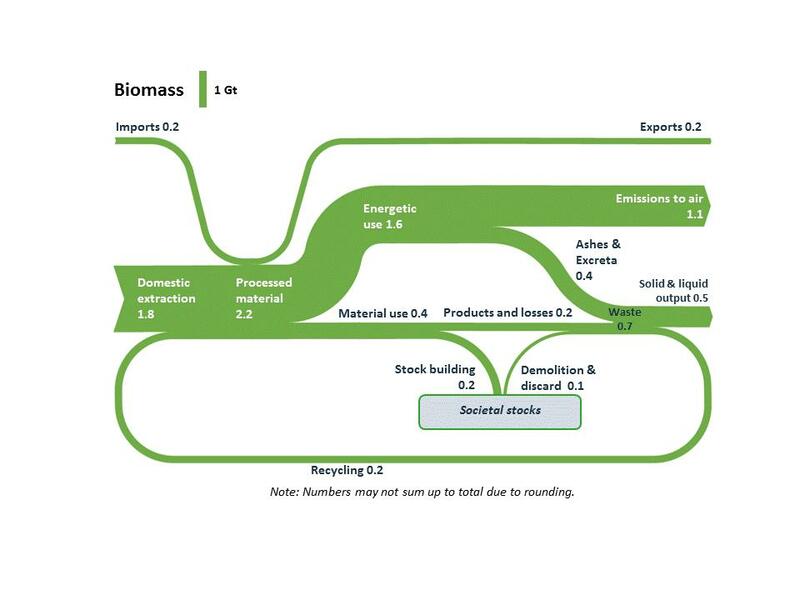 One effective illustration of the circular economy at macro level is a Sankey diagram of material flows 4 , which provides, for a given year, a representation of how materials flow in the economy from import / extraction over to production, use and then waste and reuse (recycling and backfilling). The diagram combines Eurostat economy-wide material flow accounts and waste statistics with additional data collection and research 5 . Source: Andreas Mayer, Willi Haas, Dominik Wiedenhofer, Fridolin Krausmann, Philip Nuss, Gian Andrea Blengini (forthcoming): Monitoring the circular economy in the EU28 - A mass-balanced assessment of economy wide material flows, waste and emissions from official statistics. In: Journal of Industrial Ecology. 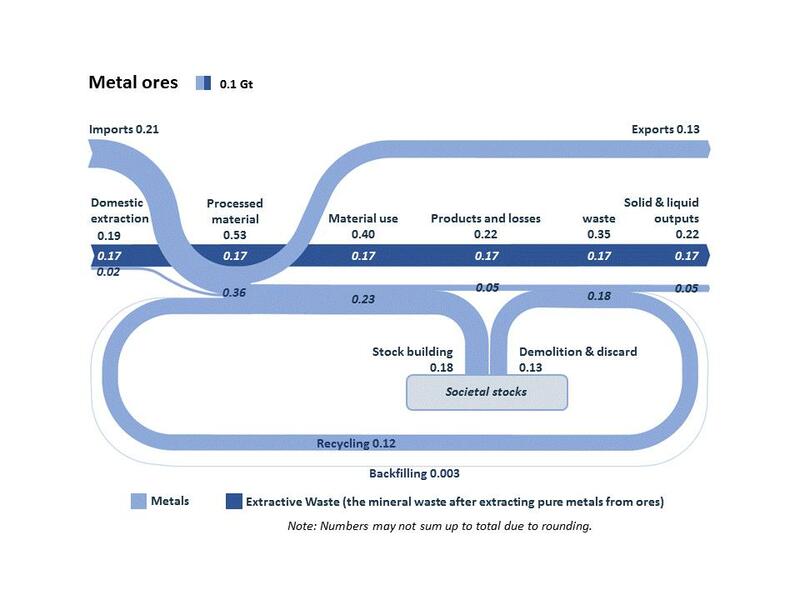 The overview of material flows in 2014 (Figure 1) shows that on input-side (on the left) 8 billion tonnes of raw materials were processed during 2014 in the EU: of this 1.5 billion (i.e. around 20%) are imported, which indicates the EU dependency on imports of materials. Out of the 8 billion tonnes of processed materials, 3.1 billion tonnes are directed to energetic use, 4.2 to material use and 0.6 are not used in the EU but exported. The output-side on the right shows that the bulk of the used materials that are used are converted into emissions to air (2.5 billion tonnes) or waste (1.5 billion tonnes). Only 0.6 billion tonnes of materials originate from recycling and are used as secondary raw materials. In addition 0.1 billion tonnes are used for backfilling. These 0.7 billion tonnes of raw materials (for recycling and backfilling) only represent one third of the 2.2 billion tonnes of raw materials that are contained in products that have reached their end-of-life ("end-of-life waste"); the remaining 1.5 billion tonnes, is waste that does not re-enter the economy. Potential for improvement lies in particular in increasing the share of recycled materials and decreasing the waste generated. It is also necessary to consider material flows in the EU disaggregated per material category. (Figure 2). 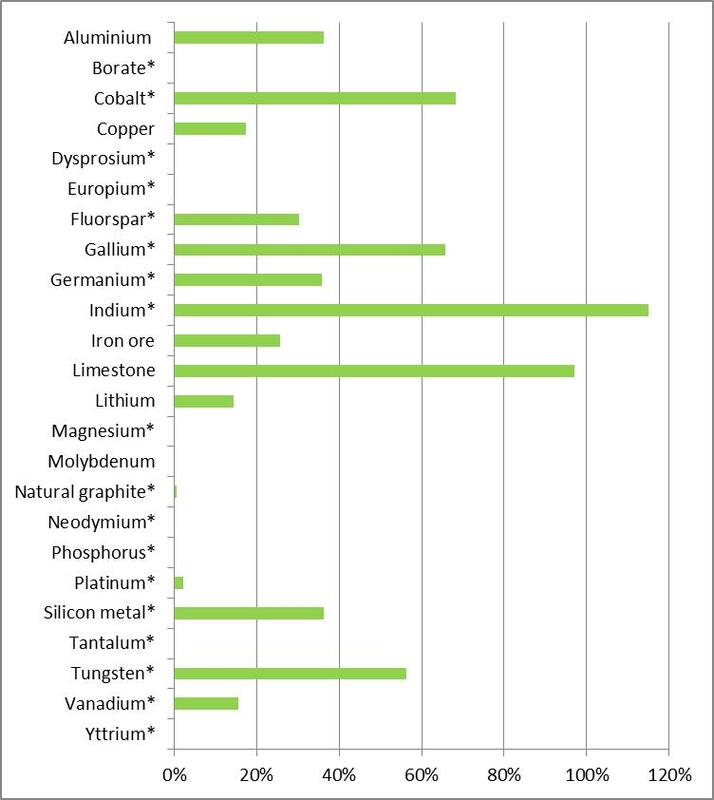 Most of the 3.5 billion tonnes of non-metallic minerals (shown at the top left) that are used in the EU originate from domestic extraction. 3.1 billion tonnes of non-metallic minerals are used to build up so-called "societal stocks" such as buildings and infrastructure. Metal ores (shown at the top right) only represent a minor fraction of the EU's material consumption in terms of mass, while they are of high value and strategic importance to the economy. More than 30% of the metals that are processed in the EU originate from recycling. Figure 2: Material flows in the EU-28 economy per material category (2014) 6 . Less than 3% of the processed fossil energy carriers (shown at the bottom left) are used as plastics, oils, tyres or for chemical purposes. More than half of these materials are recovered when they reach their end-of-life, either through recycling or backfilling. Finally, less than 20% of the processed biomass (presented at the bottom right) is used for material purposes, while the rest is used for energetic purposes such as food, feed and agro-fuels. Only 28% of biotic materials that become waste are fed back into the economy through recycling. These Sankey diagrams of material flows provide a broad picture of how circular the economy is in a given year. To monitor the progress made in the different areas of the EU action plan for the circular economy a set of meaningful indicators is however needed. The monitoring framework consists of 10 indicators, some of which are broken down in sub-indicators. The list uses available data while also earmarking areas where new indicators are in the process of being developed, in particular for green public procurement and food waste. The framework is structured into four broad areas, for which relevant indicators have been identified (see Table 1). Monitoring the production and consumption phase is essential for understanding progress towards the circular economy. In the longer term this transition may contribute to increasing the EU's self-sufficiency of selected raw materials for production in the EU. Households and economic activities should decrease the amount of waste generated. Waste generation should decrease in terms of the amount of waste produced both by households and by economic activities. In this regard municipal waste generated per capita together with the generation of waste excluding major mineral waste divided by GDP, and the efficient use of materials in the economy is expressed by generation of waste excluding major mineral waste divided by domestic material consumption. The indicator of food waste generation is relevant because it measures an important waste stream with significant environmental impact. In addition, the share of green public procurement in the economy provides useful indication of how much public funds contribute to the circular economy. This area focuses on the share of waste which is recycled as this is the treatment by which waste materials are actually returned to the economic cycle and can continue creating value. Two main indicators monitor overall progress in recycling of waste and the recycling in specific waste streams. The most appropriate indicators to track overall targets are the recycling of all waste excluding major mineral wastes and the recycling of municipal waste, which is subject to binding targets in EU legislation. The focus as regards specific waste streams is on those that currently present a significant challenge for the economy and the environment such as packaging waste, including plastic and wood, bio-waste, and electrical and electronic waste, as well as construction and demolition waste. Most of these specific waste streams are also linked to binding targets in EU legislation and to deliverables of the Action plan for the Circular Economy. To close loops of the circular economy, materials and products need to ultimately be reinjected in the economy. One of the most important indicators for the circular economy is about how recycled materials replace extraction of natural resources and how much of the waste materials are actually reincorporated back in the economy. This is the purpose of the circular material use rate and the end-of-life recycling rates indicators, the former for the overall economy and the latter for specific important materials. Moreover, in order to have an increasing share of secondary raw materials in the economy, it is important to establish stable markets for them, therefore another relevant indicator is related to the trade of recyclable raw materials between the EU Member States and with the rest of the world. A more circular economy will increase the life span of products through improving design for circularity and increasing reuse, reparability, durability, and upgradability, promoting innovative industrial processes (e.g. industrial symbiosis) and supporting innovative forms of consumption such as the collaborative economy. Two indicators are included to monitor developments in this area: one about the economics of circular economy sectors (the recycling, repair and reuse) 7 in terms of jobs, investments, and gross value added, and another one about patents related to recycling and secondary raw materials as a proxy for innovation. The framework consists of 10 indicators and is based on existing official statistics coming from Eurostat and other official sources (the European Commission including the Joint Research Centre, and the European Patent Office). As such it will not increase the administrative burden on Member States. The selected indicators have been evaluated against how they perform in terms of relevance, acceptability, credibility, easiness and robustness (also known as RACER). The indicators on green public procurement and food waste are included even if statistical work is still ongoing and data will only be available in the coming years. Member States and stakeholders were consulted during the second quarter of 2017. The current indicators take into account a careful assessment of the comments received. Most stakeholders agreed with the majority of suggested indicators. A recurrent concern was that the coverage was slightly skewed towards waste management related information while covering less the other phases of the circular economy loop such as production, consumption, re-use and repair, thereby missing out on some important transformation trends and economic opportunities. In absence of available data or even methodologies to measure these aspects, however, at present it is necessary to work with other available information that may give some more indirect indications of performance. Many valuable comments concerned technical considerations on how to populate the indicators, measurement units etc. These comments have helped to ensure a high degree of reliability and data comparison. The following table includes the final list of indicators and sub-indicators. The Commission (Eurostat) disseminates all the indicators in a newly created dedicated site 8 for the circular economy. This website also provides a brief introduction to the monitoring framework, background and a list of relevant links. The data for all the indicators and sub-indicators are reported together in a visualisation tool 9 to facilitate comparing the indicators for a given Member State or for the EU. This is the main data source for users, which can find all the information in a single place. In addition, tables for each indicator and sub-indicator, as well as the corresponding explanatory metadata, are also available in the Eurostat online database. In some cases tables with further breakdowns, alternative units (measures as percentage instead of absolute values, etc.) are also available. Raw materials are essential for the functioning of the EU's economy. A wide variety of industrial sectors depend on the secure supply of raw materials, including critical raw materials 10 , typically in a diversified mix of domestic extraction, recycling and imports. This mix is different for every raw material and depends on a number of natural and economic factors. A circular economy can contribute to reducing the supply risks related to a high import reliance of the EU for specific raw materials through enhanced recycling. The EU's self-sufficiency is different for each raw material. For some raw materials, such as indium or limestone the EU is largely self-sufficient or even a net-exporter. This is the case for the majority of non-metallic minerals 12 . For a number of bulk materials, such as aluminium, copper or iron ore, the EU's self-sufficiency varies between 15% and 40%. For some of these materials recycling's contribution to total materials demand stands between 20% and 30% (see indicator 7a). For most critical raw materials there is a major supply risk, i.e. linked to geopolitical risks in some countries. In most cases the supply from recycling for these materials is relatively low compared to total demand (see indicator 7a). This is mostly because primary extraction is often more economic than recycling, since these materials are used in very small quantities (making collection and separation costly) and/or because it is often difficult to recycle these materials at sufficient degrees of purity. ·Definition: Self-sufficiency is defined as (1 – (net) Import reliance). oThe indicator provides insights in the differences between materials: for certain raw materials the EU is more self-sufficient than for others. The data source allows for a disaggregation per material, which adds important nuance. oDue to increasing demand for certain materials, even if 100% were recycled, the EU would still not be self-sufficient. For example, annual demand in the EU for raw materials used in solar photo voltaic technologies (such as silicon, copper, tellurium and indium) is expected to increase by 270% by 2030.
oThe indicator should be considered in a broader context considering potential disruption of supply in the context of economically sensitive areas. International trade is very important for the EU economy. For certain materials with high supply risks, the analysis of self-sufficiency, in combination with an analysis of the source countries for these materials, can help assessing supply risks for these materials. oWhereas the indicator provides an insight into the current situation, it does not assess potential future sources, increases in demand, nor the potential import/extraction reductions feasible through increased recycling. ·Data source: European Commission, List of Critical Raw Materials (2017), based on data from the British Geological Survey and the Austrian Federal Ministry of Science, Research and Economy's World Mining Data, who both collect data from national agencies. The European Commission 14 has committed to updating the list of Critical Raw Materials every 3 years (COM (2011) 25). The third, 2017 assessment includes 78 materials. Public procurement accounts for a large proportion of European consumption (approximately 14% of EU GDP). If circularity requirements (reparability, durability, recyclability etc.) are systematically included in public contracts, public procurement can play a key role in the circular economy. The indicator is relevant to target Sustainable Development Goal 12.7. Promote public procurement practices that are sustainable, in accordance with national policies and priorities. The indicator is under development. Data will be collected for the first time with a new version of the public procurement standard forms 15 , which is currently under preparation. A question on green public procurement would be mandatory to answer in all public procurement procedures in the EU above the procurement thresholds 16 , which are around 150 000 procurement procedures a year. It should be noted that it will take several years for this data to become available. Presently the horizon is to have the data by 2020. ·Definition: The share of public procurement procedures above the EU thresholds, in number and value, which include environmental criteria. In the forms to be completed for all tenders above the EU value thresholds, public authorities could tick 'yes' or 'no' to say if in the tender documents, a 'technical specification, award criterion, or contract performance condition aims at reducing the environmental impact of the procurement'. ·Interpretation: For the first time, such information would be available for the procurement above the thresholds for the whole EU (more than 150 000 procedures per year) 17 . Identifying product groups and Member States with less GPP uptake informs and allows initiation of more targeted actions. 'Aiming to reduce environmental impact' is likely to be interpreted differently by different authorities. This stems also from the fact that 'reducing environmental impact', and the underlying concept of 'green procurement' is a complex, multi-faceted issue where finding a perfectly accurate legal or environmental definition may not be possible. The results might generate an overly positive picture of the use of GPP especially for the value of green tenders. The most valuable contracts are often in the field of construction where almost every public authority is likely to take some environmental element into account. The indicator is a proxy showing trends in a significant proportion of the demand side. In addition, not all the criteria will necessarily relate to the circular economy. This indicator focuses on municipal waste. Even though municipal waste only represents about 10% in weight of the total waste generated or about 30% of the generated amount of waste excluding major mineral waste, following up on its evolution can give a good indication of changing consumption patterns, Member States' waste prevention performance and where citizens' actions and involvement is most relevant. Note: 2016 data for Ireland, Greece, Austria, Portugal, Romania, Finland and United Kingdom are not available and the following data are used: (2015) Greece, Austria, Romania, Finland and United Kingdom, (2012) Ireland and (2014) Portugal. 2010 data for Denmark are not available and 2011 value is reported instead. In 2016 each EU citizen generated on average 480 kg of municipal waste, down from 515 kg in 2005 (-6.8%). In absolute terms, municipal waste in the EU decreased from 255 million tonnes to 245 million tonnes during the period 2005-2016. Municipal waste generation vary considerably across countries in 2016, ranging from 762 kg per capita in Denmark to 247 kg per capita in Romania (for Romania this refers to 2015). Five Member States produce more than 600 kg of municipal waste per capita, while two countries produce less than 320 kg per capita. This is due partly to differences in consumption patterns and economic wealth and partly to how municipal waste is currently collected and managed. Different levels of municipal waste an also reflect differences in the organization of the municipal waste management, as well as different methods for measuring municipal waste generated. 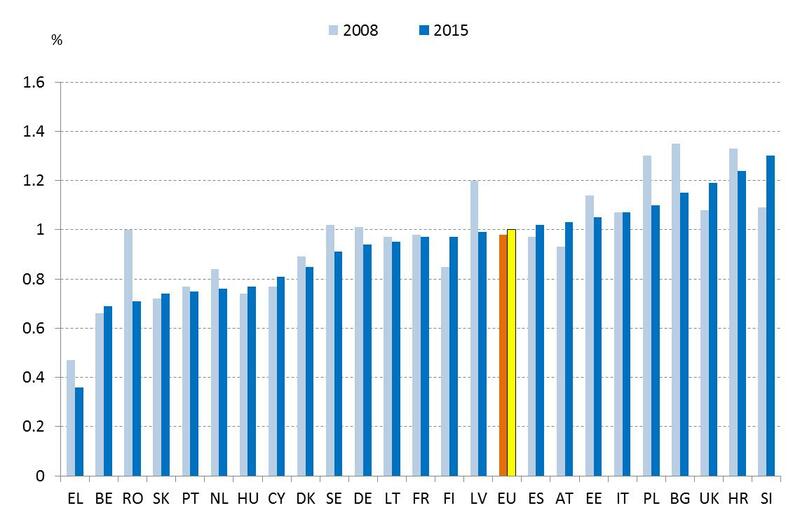 While over the period 2005-2016 municipal waste per capita has decreased in the EU, Member States show different trends. In particular, six countries increased municipal waste per capita by more than 10%, while Romania, Bulgaria Spain and United Kingdom reduced their municipal waste per capita generation by more than 20% during 2005-2016. ·Definition: The amount of municipal waste generated consists of waste collected by or on behalf of municipal authorities and disposed of through the waste management system. It consists to a large extent of waste generated by households, though similar wastes from sources such as commerce, offices and public institutions can be included. The scope of data collection on similar waste may currently vary from municipality to municipality and among Member States, depending on the local waste management system. This issue is addressed in the Commission proposal to amend the Waste Framework Directive with the introduction of a harmonised, legally binding definition of municipal waste 18 . Wastes from agriculture and from industries are not included. Overall municipal waste generated is divided by the population. ·Interpretation of the indicator: Reducing municipal waste generation is an indication of the effectiveness of waste prevention measures and changing patterns of consumption. Concentrating on municipal waste rather than on industrial waste has the advantage that it reflects the consumption side and is not affected by the presence or lack of large manufacturing sectors in a country. The indicator is based on solid data and is available in time series. The population is factored in to allow for comparability among Member States. However, the different interpretations of the definition currently limit to some extent the comparability among countries; therefore the most important information is given through the time series. In the circular economy, waste generation is decoupled from GDP growth, i.e. waste generated increases less rapidly than GDP (relative decoupling ) or decreases even when the economy is growing (absolute decoupling). Comparing waste generated to GDP 19 reflects the waste intensity of the economy and provides a measure of "eco-efficiency". The indicator on overall waste generation excludes major mineral waste because the weight of total waste generation and treatment is mainly driven by mineral waste from construction/demolition and from mining activities 20 , and the latter widely varies in importance across Member States. Excluding major mineral wastes reflects more accurately general trends than the total waste and improves comparability across countries. Note: 2010 data for Cyprus not available. In 2014 in the EU 66 kg of waste (excluding major mineral waste) was generated per thousand EUR of GDP. 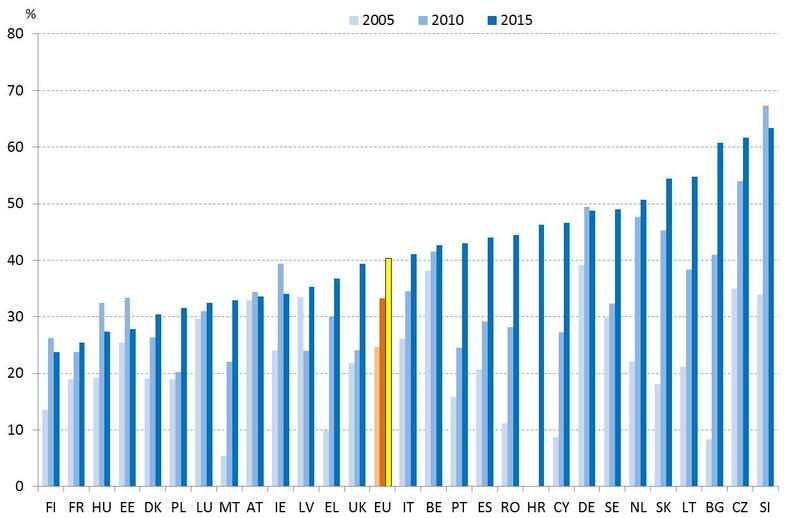 Waste generation per GDP decreased by 11% in the EU between 2006 and 2014, thus improving eco- efficiency of economic activity. The waste generated per GDP shows a wide variation among Member States: six Member States produced less than 50 kg of waste (excluding mineral waste) per EUR GDP, while few countries have a value of more than 400 kg/ thousand EUR GDP. The presence of certain industries affects the level of waste generation; for example high value for Estonia is due to waste from energy production from oil shale. 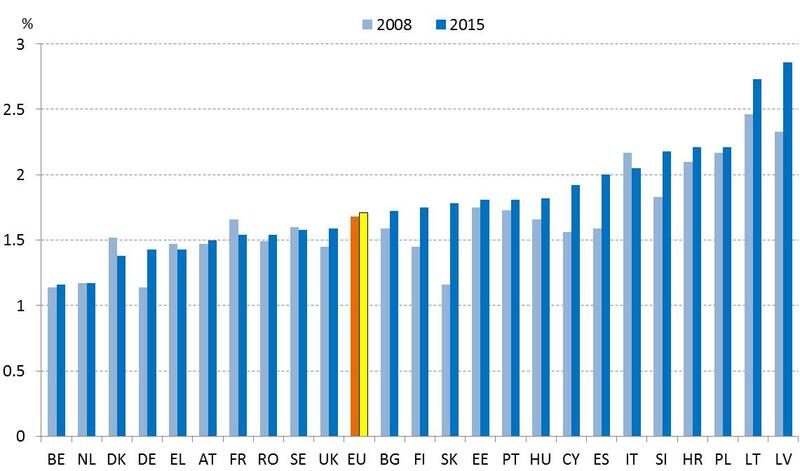 During 2006-2014 the indicator decreased by more than 50% in Lithuania, Portugal and Romania, while increasing by more than 30% in Italy and Ireland. This may be partially explained by the impact of the financial crisis. ·Definition: This indicator is defined as all waste generated in a country, excluding major mineral waste, per GDP unit. 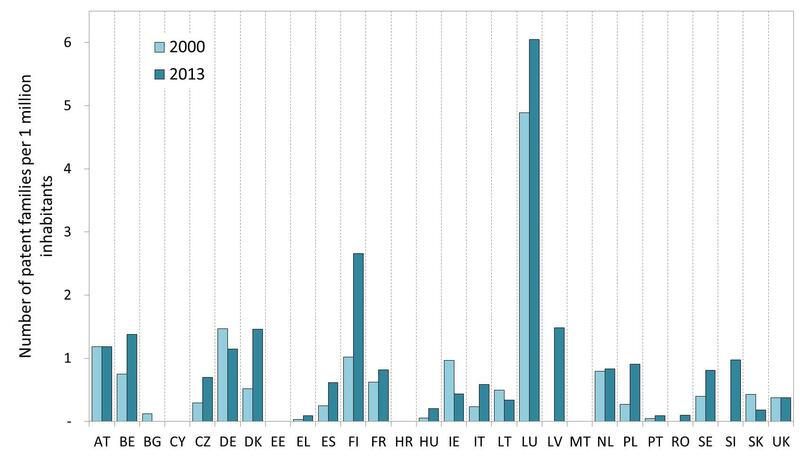 Major mineral waste accounts, on EU average, for almost two thirds of total waste generated. Its exclusion enhances comparability across countries as mineral waste accounts for high quantities in some countries due to economic activities such as mining and construction. oDifferences in waste classification by Member States may result in partial non-comparability, e.g. high value for Estonia results from including waste from energy production. oDifferences in purchasing power are not fully reflected in exchange rates, thus undermining comparability across Member States. oDifferent structures of the economy as regards materials-intensive sectors and specialization of certain Member States in high value services (e.g. finance or IT sectors). ·Data source: Eurostat. Generation of waste by waste category, hazardousness and NACE Rev. 2 activity ( env_wasgen ) collected on the basis of the Regulation on waste statistics (EC) No. 2150/2002, amended by Commission Regulation (EU) No. 849/2010. The information on waste generation is broken down by source (several business activities according to the NACE classification and household activities) and by waste category (according to the European Waste Classification for statistical purposes). The latter allows disclosing and excluding major mineral waste. This indicator tracks the efficiency of EU material consumption by comparing the tonnes of waste generated to domestic material consumption (DMC). DMC sums up the total use of resources driven by domestic demand distinguishing it from consumption driven by the export market. Therefore, this indicator gives an indication of "material efficiency". Note: 2010 data for Cyprus is missing and the graph shows 2012 instead. In 2014 on average the EU produced 0.13 kg of waste (excluding major mineral waste) per kg of DMC, that means that 13% of domestic materials consumption ended up as waste. Waste generation per DMC increased by 11% in the EU between 2006 and 2014, resulting from a decrease of waste generation by 8% and a simultaneous decrease of DMC by 19%, which indicates that efficiency of material consumption decreased in terms of waste production. 2014 data show a wide variation among Member States: the indicator ranges from less than 5% in Romania and Latvia to 25% in the Netherland and Italy, reaching 34% (or 0.34 kg waste/kg DMC) in Estonia (due to the use of oil shale for energy production). ·Definition: the indicator has the same numerator as indicator 3b above, but it uses DMC as denominator. DMC is defined as the annual quantity of raw materials extracted from the domestic territory, plus all physical imports and minus all physical exports. ·Interpretation of the indicator: The indicator serves as a material efficiency indicator by comparing the quantity of waste generated to DMC. The smaller the value of the ratio, the better the performance. The indicator’s major advantage for comparison across countries and over time is that it is less affected by differences in the production structure of an economy. DMC does not include upstream "hidden" flows related to imports and exports of raw materials and products 21 . This indicator is a ratio that may not be very meaningful without further context indicators. The ratio is strongly influenced by the non-metallic mineral component of DMC. ·Data source: Eurostat. Generation of waste by waste category, hazardousness and NACE Rev. 2 activity (env_wasgen) collected on the basis of the Regulation on waste statistics (EC) No. 2150/2002, amended by Commission Regulation (EU) No. 849/2010. The information on waste generation is broken down by source (several business activities according to the NACE classification and household activities) and by waste category (according to the European Waste Classification for statistical purposes). The latter allows disclosing and excluding major mineral waste. Economy-Wide Material Flow Accounts ( env_ac_mfa ) for Domestic Material Consumption. Food waste is waste which is generated in the production, distribution and consumption of food. Food waste is a significant concern in Europe (estimated to be around 20% of all food produced), and it is associated with pressure on finite natural resources, the environment and climate change. It also has important financial costs, which have been estimated as 143 billion EUR 22 for the EU in 2012. A priority sector of the EU action plan for the circular economy addresses food waste and the sustainability of the food system. In the context of the 2030 Agenda for Sustainable Development, the indicator is relevant to target Sustainable Development Goal 12.3: "by 2030 halve per capita global food waste at the retail and consumer level, and reduce food losses along production and supply chains including post-harvest losses". The Commission has started work on producing a consistent measurement of food waste levels in the EU. This is quite complex as food waste needs to be measured all along the food value chain, including on the farm, in processing and manufacture, in shops, in restaurants and canteens and in households. In addition, Eurostat performed a voluntary exercise with the Member States for the reference year 2012: on a voluntary basis, several Member States provided detailed data for waste codes that may contain food waste as a plug-in to the waste statistics data collection based on Regulation (EC) 2150/2002. Eight Member States sent data for the two years 2012 and 2014. On the basis of these data Eurostat produced a preliminary estimate for an indicator on food waste, which could only be made at EU-28 level. According to these calculations, food waste in the EU amounted to 81 million tonnes in 2012 and 76 million tonnes in 2014, suggesting a 7% decrease from 161 to 149 kg per capita. This estimate is coherent with figures that the European Commission published for the reference year 2012 on the basis of the FUSIONS study 23 : 87.6 million tonnes of food wasted in the EU-28 (with an error margin of +/- 14 million tonnes). Per capita data were 173 kg (error margin of +/- 27 kg). This estimate includes both edible food and inedible parts associated with food. At present there is no definition of food waste in EU regulatory frameworks. However food waste is understood in the light of definitions of food (from General Food Law) and of waste (from Waste Framework Directive) i.e. as food which has been discarded. A definition of food waste has been proposed by the European Parliament in the context of the current revision of Waste Framework Directive 24 . ·Definition: Amount of food waste generated per year. The indicator is being developed 25 . ·Data source: New reporting obligations for Member States (in the Commission Proposal amending the Waste Framework Directive - Art 9.3). Statistics on waste gathered for the purpose of reporting under the Waste Statistics Regulation 26 . Whereas Eurostat does not have data for a proper indicator, there is long term work ongoing (see above section latest available information) which may allow deriving proxy indicators until a fully elaborated system is in place (expected to be set up by the European Commission and with the first data becoming available for reference year 2020). The recycling of municipal waste indicates how waste from final consumers is used as a resource in the circular economy. Municipal waste reflects mainly waste generated by the final consumers as it includes waste from households and waste from other sources that is similar in nature and composition to household waste. It accounts for around 10% of total waste generated in the EU in weight (30% when excluding major mineral waste). Because of its heterogeneous composition, a sound management of municipal waste is challenging. The recycling rate of municipal waste provides a good indication of the quality of the overall waste management system. This indicator supports monitoring progress towards the 50% recycling target for 2020 set in the Waste Framework Directive and to the 65% recycling target for 2030 proposed in the legislative proposal on waste. Figure 5.1 shows the amount of waste generated at EU level and the composition by treatment category (landfill, incineration, recycling, composting). 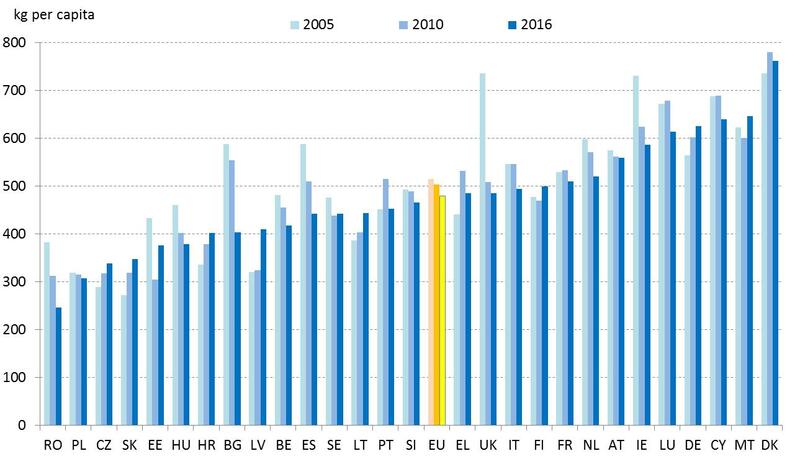 During the period 1995-2016 the EU recycling rate of municipal waste has increased continuously to reach 45.6% of the total treated (equivalent to 140 kg per capita). Since 2014 the EU recycling rate of municipal waste is higher than both the landfill rate and the incineration rates. Note: 2016 data for Ireland, Greece, Austria, Portugal, Romania, Finland and United Kingdom not available and the following are used: Greece, Austria, Romania, Finland, United Kingdom (2015), Portugal (2014) and Ireland (2012). 2005 data for Croatia refer to 2007. 2010 data for Denmark refers to 2009. During the period 2005-2016 the EU recycling rate of municipal waste increased by 13.7 percentage points to reach 45.6% in 2016. 2016 data show that the recycling rate of municipal waste varies a lot among Member States. Austria, Belgium, Germany, the Netherlands and Slovenia recycled more than 50% of their municipal waste. Germany has already achieved the 65% recycling target set for 2030. 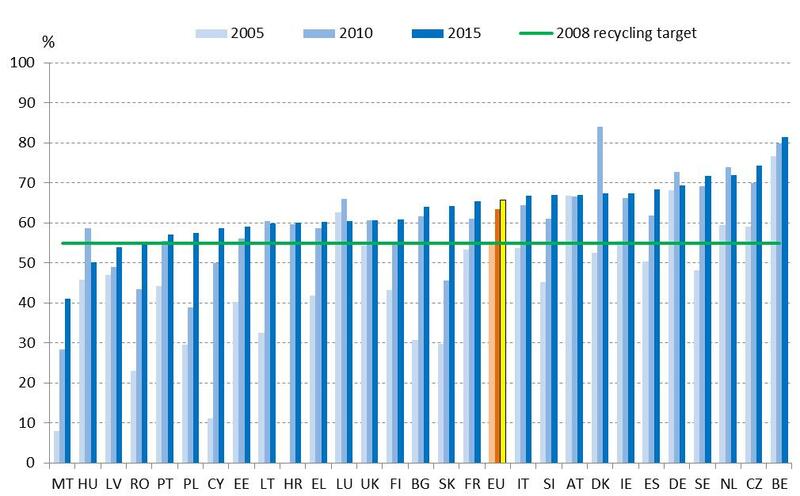 An ongoing catch-up process can be observed, as the growth rate of recycling was the highest for those Member States, which started to introduce recycling practices to waste management more recently. The methodology for calculating recycling rates is currently not harmonised across Member States (see below). ·Definition: The recycling rate is the share of recycled municipal waste in the total municipal waste generation. For areas not covered by a municipal waste collection scheme the amount of waste generated is estimated. The Member States report every year to Eurostat data on the generation and treatment of municipal waste. ·Interpretation of the indicator As regards comparability among Member States, it should be taken into account that countries measure the recycled quantities in different ways, for instance before or after sorting of collected waste, which has implications on accuracy and comparability. This issue is currently being addressed in the revised waste proposals. The recycling rate of all waste excluding major mineral waste indicates the extent to which key waste materials are reincorporated in the economy. It adds the production phase to the final consumption phase reflected by municipal waste recycling and in this way encompasses the trends in recycling waste arising from both consumption and production. In 2014 EU recycling rate of waste (excluding major mineral waste) was 55%, increasing from 53% in 2010. The recycling rate varies a lot among Member States: from Member States having a share of more than 70% (Belgium 78%, Slovenia 75% and the Netherlands 72%), to some others having a share of less than 20% (Estonia, Bulgaria and Greece). ·Definition: This indicator is defined as the share of waste that is recycled divided by all waste treated in a country, excluding major mineral wastes which mainly arise from mining and construction. ·Interpretation of the indicator: The indicator corrects Waste Statistics Regulation treatment data with data on imports and exports and as such takes into account the amount of waste collected in one country and recycled in another country. Its development indicates the overall progress in recycling performance. ·Data source: Eurostat. Management of waste excluding major mineral waste, by waste operations ( env_wasoper ) collected on the basis of the Regulation on waste statistics (EC) No. 2150/2002, amended by Commission Regulation (EU) No. 849/2010. The information on waste treatment is broken down by type of treatment and by waste categories (according to the European Waste Classification for statistical purposes). The latter allows disclosing and excluding major mineral waste. for imports and exports of waste materials from Foreign Trade Statistics. Packaging represents 9.3% of waste generated excluding major mineral waste in the EU. It generally consists of homogeneous materials which are particularly suitable for recycling. In the waste legislation, specific recycling targets are set for packaging, and the revised legislative proposal on waste includes increased recycling targets for packaging materials by 2025 and 2030. Note: In absence of 2010 data for Croatia, 2012 data are included. In absence of 2015 data, 2014 data are shown for the following countries: Cyprus, Denmark, Malta and Romania. The EU recycled 65.7% of all packaging waste in 2015, showing an increase by more than 10 percentage points compared to 2008 (54.6%). 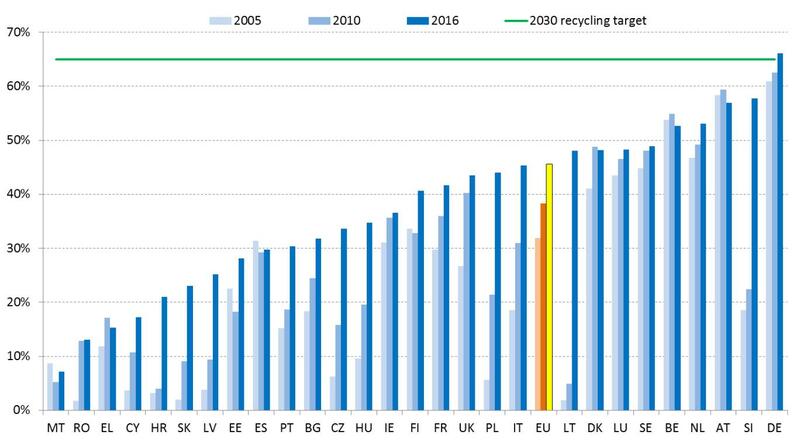 In 2015 the ‘2008 recycling target’ of 55% recycled packaging waste was met by all Member States except Hungary and Latvia; Romania and Malta had not reached the target in 2014 (no data are available for 2015). The Member States with a recycling rate higher than 70% are Belgium (81.5 %), Czech Republic (74.3%), the Netherlands and Sweden (both almost at 72%). Eleven Member States have a share higher than 65%. 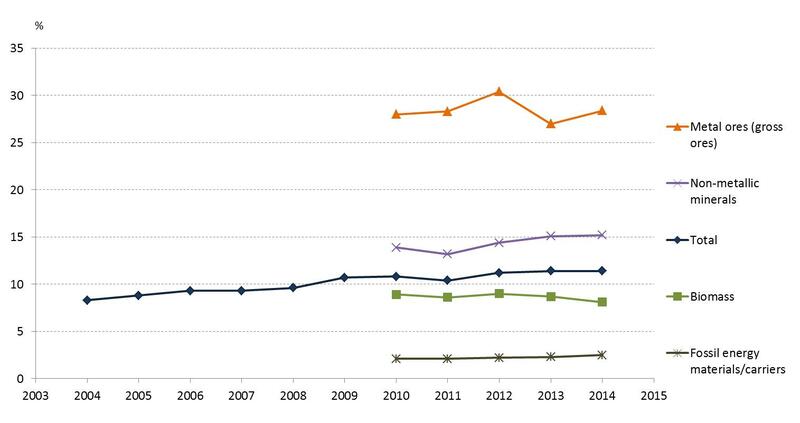 During 2005-2015 the recycling rate of packaging waste increased in most Member States, in particular in Cyprus and Malta (increase by more than 400%) which had the lowest levels in 2005. Other Member States increased the share of packaging recycling by more than 80% (Bulgaria, Lithuania, Poland, Romania and Slovakia). Definition: Packaging waste covers all the waste packaging materials from products used for the containment, protection, handling, delivery and presentation of goods, from raw materials to processed goods, from the producer to the user or the consumer, excluding production residues. ·Interpretation of the indicator: The indicator is used to monitor progress towards the 55% packaging recycling target set for 2008 and the proposed 65% and 70% targets by 2025 and 2030 respectively. In some cases differences between Member States are due to methodological differences, i.e. the possibility to report output of sorting instead of input to recycling if there are no significant losses. It should be taken into account that in most cases Member States assume that waste generated is equal to the amounts of packaging placed on the market in a given year in that country, which might be underreported and inflate recycling rates. ·Data source: Eurostat . Packaging waste by waste operations and waste flow ( env_waspac ) on the basis of Directive 94/62/EC of 20 December 1994 on packaging and packaging waste, last amended by Regulation (EC) No 219/2009. Increasing plastic recycling is essential for the transition to a circular economy. The use of plastics in the EU has grown steadily, but less than 30% of plastics is collected for recycling and another third goes to landfill. Large quantities of plastics, including packaging, also end up in the oceans and are the principal cause of marine litter. Plastic packaging accounts for around 60% of plastic waste in the EU. During 2005-2015 EU generation of plastic packing waste increased by almost 12% to reach 15.8 million tonnes, i.e. 31 kg per capita. In the revised legislative proposal on waste, the Commission has proposed an EU-wide target of 55% on recycling plastic packaging (by 2025): this indicator will allow monitoring progress towards this target. Note: in absence of the 2015 data, 2014 data are shown for Denmark, Malta, Romania and Cyprus. The EU recycling rates of plastic packaging increased from 24.7% to 40.3% between 2005 and 2015 27 . Slovenia is the Member State which recycled the highest percentage of plastic packaging waste (63.4%). It is followed by five countries with a share higher than 50%. 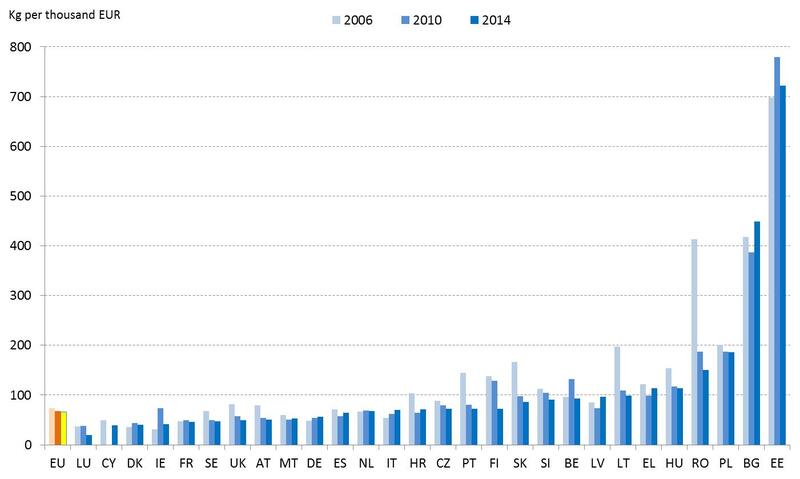 Though the share varies a lot among Member States, it has increased in all countries during the decade 2005-2015. ·Definition: The recycling rate for plastic packaging is calculated as the total quantity of recycled plastic packaging waste in the plastic packaging waste generated (both in mass unit). ·Interpretation of the indicator. The same considerations apply as for the indicator on recycling of all packaging waste. In a circular economy, a cascading use of renewable resources, with several reuse and recycling cycles, should be encouraged where appropriate. In the case of wooden packaging, reuse is often a suitable solution. Once reuse is no longer possible, recycling is the option that best supports the circular economy. In the revised legislative proposal on waste, the Commission has proposed an EU-wide 2030 target of 75% on preparation for reuse and recycling of wood packaging. Note: In absence of 2015 data, 2014 data are included for: Cyprus, Denmark, Malta and Romania. Recycling rates of wooden packaging increased from 36.5% to 39.8% between 2005 and 2015 in EU. Sweden and Lithuania increased their recycling rate from 2% and 1.2% in 2005 to 21.5% and 24.8% in 2015, respectively. Sweden recycled more waste than it generated in 2010, which indicates that this Member State recycled wooden packaging placed on the market by other countries. The data reveal that some Member States are less advanced in terms of recycling rate of wooden packaging, in particular those where this waste is subject to energy recovery. ·Definition: The recycling rate of wood packaging is calculated as the total quantity of recycled wood packaging waste divided by the total quantity of generated wood packaging waste (both in mass unit). ·Interpretation of the indicator: The same considerations apply as for the indicator on recycling of all packaging waste. ·Data source: Eurostat Packaging waste by waste operations and waste flow ( env_waspac ) on the basis of Directive 94/62/EC of 20 December 1994 on packaging and packaging waste, last amended by Regulation (EC) No 219/2009. Waste electrical and electronic equipment (WEEE) 28 , also known as e-waste, comprising items such as out of use computers, televisions, fridges and mobile phones, is one the fastest growing waste streams in the EU. Some 9 million tonnes were generated in the EU in 2012 and it is expected that this will grow to more than 12 million tonnes by 2020. WEEE poses on the one hand a risk to the environment (hazardous components), on the other hand it has a high potential for recycling to replace raw materials by secondary raw materials, such as precious metals and other highly valuable special materials. Compared with other waste streams, e-waste may not appear to be significant in terms of weight. However, it provides a good example of the untapped potential to recover valuable raw materials. 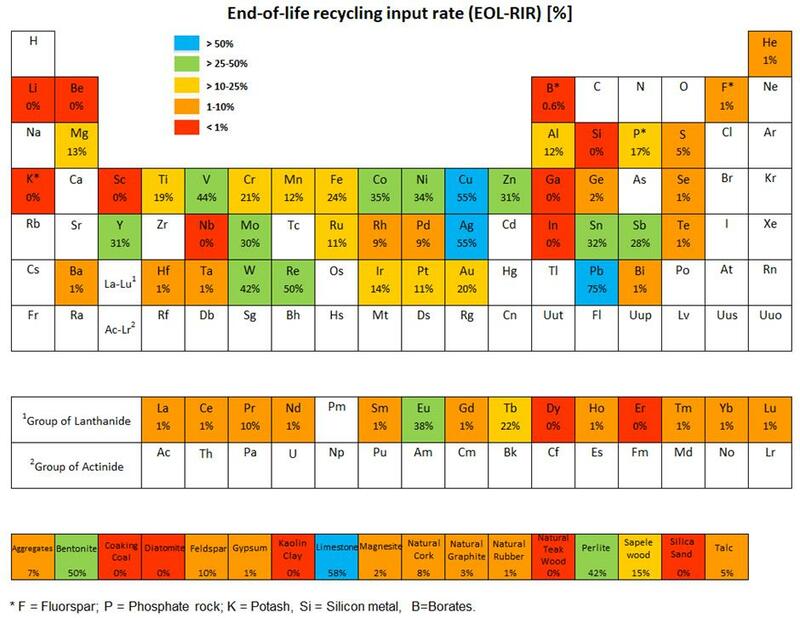 It is estimated that up to 60 out of 118 chemical elements in the periodic table can be found in complex electronics, many of which could be recovered although their present recycling levels are very low. Critical raw materials such as gallium, germanium, indium, and dysprosium are predominantly used in EEE and are a priority area of the EU action plan for the circular economy. The indicator provides a measure of the WEEE recycled and prepared for reuse taking into consideration the electrical and electronic equipment (EEE) 29 that had been put on the market having a high potential for recycling to replace raw materials by secondary raw materials. Note: in absence of 2009 data, the following are shown: 2010 data for Latvia, Italy, United Kingdom, Czech Republic, Ireland and Bulgaria. In absence of 2015 data, 2014 data are shown for the EU, Malta, Cyprus, Romania, Spain, Italy and Germany. The EU recycling rate of e-waste has increased from 28.8% in 2012 to 32.2% in 2014. The levels of collection, reuse and recycling of e-waste vary considerably across Member States, indicating the potential to improve resource efficiency. Malta is being on one side of the scale with a e-waste of 11.5% in 2014, while Bulgaria was the best performing Member State with 96.5% (in 2015, compared to 68% in 2014). The high growth-rates were due to a campaign: many additional collection campaigns were organised in 2015 to provide the necessary amount of WEEE to fulfil the national target for the collection of EEE. 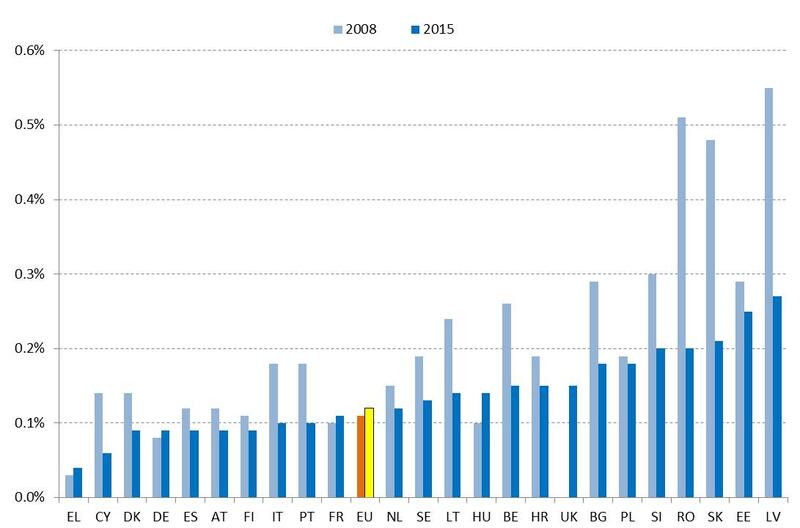 In most Member States recycling of e-waste has increased during the period 2009-2015. 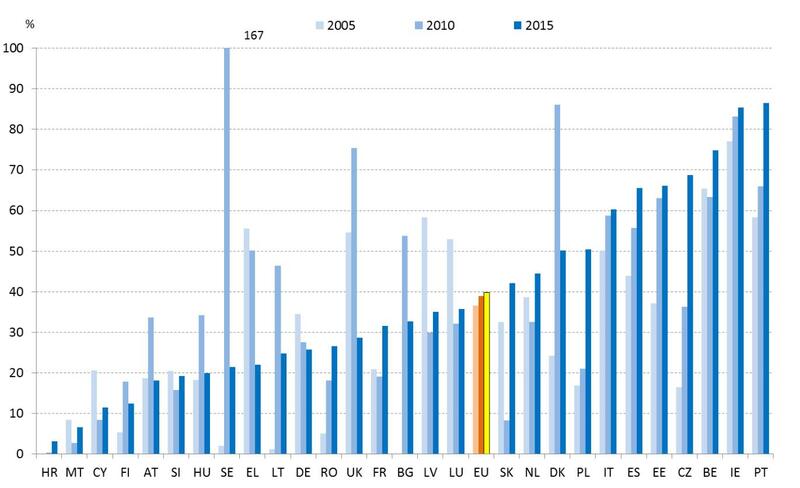 Some Member States show big increase as they have increased not only recycling but also the amount of waste collected. othe 'reuse and recycling rate' is calculated by dividing the weight of WEEE that enters the recycling/preparing for re-use facility by the weight of all separately collected WEEE in accordance with Article 11(2) of the WEEE Directive 2012/19/EU, considering that the total amount of collected WEEE is sent to treatment/recycling facilities. The indicator is calculated on the basis of data reported by Member States to Eurostat on EEE placed on the market, WEEE separately collected, and WEEE recycled/prepared for reuse. Preparing for reuse and recycling are reported to Eurostat together. The 'reuse and recycling rate', as addressed in the Directive 2012/19/EU, measures the efficiency of the treatment process only and thus does not match with this indicator 'recycling rate of e-waste', which considers the entire chain from put on the market, collection and treatment. ·Interpretation of the indicator: The indicator is commonly used in the context of monitoring recycling at Member State level (e.g. in the Resource Efficiency Scoreboard). Overall weight-based figures do not adequately capture recycling rates for critical raw materials which are typically present in e-waste in low quantities compared to the total weight of the e-waste. The indicator also does not capture options higher in the waste hierarchy – repair / reuse / remanufacturing. ·Data source: Eurostat. Waste electrical and electronic equipment (WEEE) by waste operations ( env_waselee ). Directive 2012/19/EU on waste electrical and electronic equipment (WEEE) which introduces stepwise higher recycling and preparation for re-use targets that apply from 2012 to 2018 (and beyond). The indicator relates explicitly to bio-based materials. Biowaste from households is particularly important as it is often mixed with other waste and landfilled, contributing significantly to climate change. Separate collection of biowaste and its subsequent recycling (usually in the form of composting or digestion, although other technologies are also being developed) is essential to achieving high recycling rates of municipal waste (currently contributing to the recycling of about 17% of total municipal wastes in mass terms). At the same time, it deserves special attention as currently a number of countries do not collect municipal biowaste separately and recycling levels of this important waste stream remain low. Note: in absence of 2016 data, the following are used: (2015) Greece, Austria, Romania, Finland and United Kingdom, (2014) Portugal and (2012) Ireland. 2005 data for Croatia and EU refers to 2007. Every EU citizen recycled on average 79 kg of municipal bio-waste in 2016, an increase of more than 23% compared to 2007. Recycling biowaste per capita varies among Member States, ranging from less than 10 kg per capita in some Member States to more than 100 kg per capita in others. The recycling of bio-waste per capita has increased in all Member States during 2005-2016, with just few exceptions. ·Definition: The indicator recycling of biowaste is indirectly measured as the ratio of composted/digested municipal waste (in kg) over the total population. ·Interpretation of the indicator: Although it is desirable to know the rate of municipal biowaste recycling, there is no reliable data on waste generation for this fraction as part of the biowaste ends in the mixed municipal waste. Therefore, the amounts of biowaste composted per capita will be monitored, which gives appropriate indication for the progress achieved by Member States along time and allows for comparability amongst them. Note that comparability can be weakened by the fact that most countries only count as recycling composting of separately collected waste, whereas others include also organic material recovered as a result of mechanical biological treatment. ·Data source: Eurostat. Municipal waste by waste operations ( env_wasmun ). Construction and demolition is the single biggest source of waste in the Europe: construction contributed to 33.5% of the total waste in the EU-28 in 2014 (with 871 million tonnes). Important factors for feeding these materials back into the economy and preserving their value as much as possible are the design of building materials and constructions, selective demolition of constructions, allowing for a separation of the recoverable fractions and the hazardous materials, as well as quality assurance schemes to build up trust in recycled materials. Most materials contained in construction and demolition waste can be easily recycled; therefore, this waste stream constitutes a valuable source of secondary raw materials. It is covered by a mandatory recovery target (70% by 2020) under the Waste Framework Directive (2008/98/EC). So far the indicator is based on data collected under Regulation (EC) No 2150/2002 on waste statistics. In 2014 the EU recovered around 88% of overall construction and demolition waste, showing an important increase of 10 percentage points since 2010. This figure includes backfilling (see below). The recovery rate of construction and demolition waste was higher than 90% in 17 Member States. However, there is a wide variation among Member States, with eleven Member States having a share of 95% or more and two Member States with a share of 40% or less. In 2014 only seven Member States had not reached the 2020 target of 70% recovery of construction and demolition waste. ·Definition: The recovery rate of construction and demolition waste is the ratio of construction and demolition waste which is prepared for re-use, recycled or subject to material recovery, including through backfilling operations, divided by the construction and demolition waste collected and treated. The indicator covers the waste category 'Mineral waste from construction and demolition' (EWC-Stat 12.1). Only non-hazardous waste is taken into account. ·Interpretation of the indicator: Further efforts are needed to improve the quality of the data for this indicator, in particular as regards waste generation. In addition, the most valuable fractions within construction and demolition (e.g. metals, plastics, glass, which contain scarce materials or require high amounts of energy to be produced) represent only a small percentage of construction and demolition waste; therefore high reuse or recovery rates lead to significant sustainability gains, which would not be duly reflected in the overall recovery statistics. The indicator recovery rate includes backfilling 30 . An indicator excluding backfilling would be a recycling rate. Backfilling is lower in the waste hierarchy than recycling, but currently there is no harmonised application of the definition of backfilling in the Waste Framework Directive so the dividing line between recycling and backfilling differs among Member States. 31 Once there is a more uniform application of this distinction, the indicator will focus only on recycling of construction and demolition waste. ·Data source: Eurostat . Treatment of waste by waste category, hazardousness and waste operations ( env_wastrt ) collected on the basis of the Regulation (EC) No 2150/2002 on waste statistics. The use of secondary raw materials is a key part of the circular economy, and it is important to be able to measure it. For this purpose, two separate indicators have been developed, based on different dataset. The first one (indicator 7a) focusses on a subset of specific materials, whereas the second one (indicator 7b) gives an overall view of the use of secondary raw materials in the economy. The use of secondary raw materials contributes to developing a solid circular economy. For most materials, the share of secondary raw materials is far below the economy’s demand for materials, even though overall recycling rates for certain materials are relatively high. In contrast to the indicators of the monitoring framework on waste management, which focus on collection or recycling rates of certain waste streams, this indicator measures recycling's contribution to materials demand per type of material for a selected subset of materials. 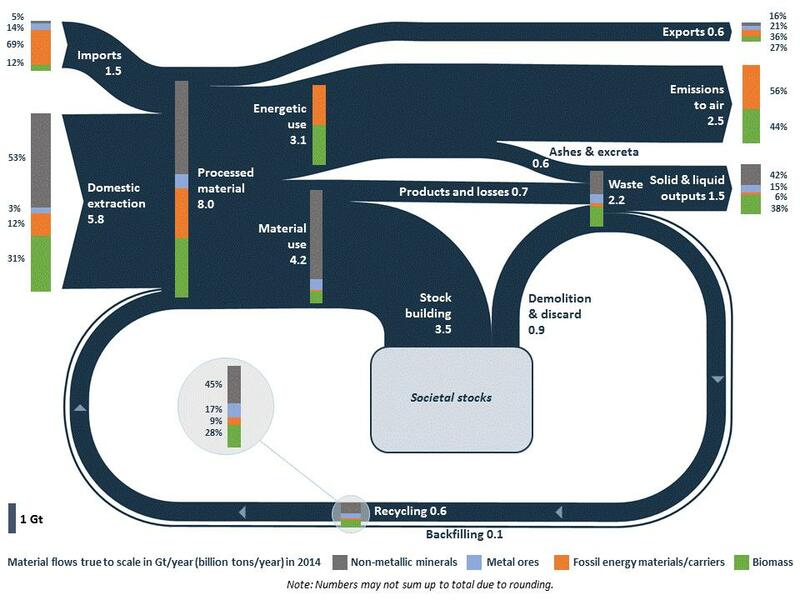 In this sense this indicator provides complementary information on the recycling flow in the Sankey diagram on materials flows in the circular economy, i.e. a disaggregation per material of recycling's contribution to materials demand. The share of secondary raw materials in total materials demand is higher than 50% for only a very limited number of raw materials. For lead it is 75%, mostly because tightly regulated closed-loop recycling systems exist for lead batteries. The high rates for copper and silver can be explained by the materials' high intrinsic economic value. For a number of bulk materials (e.g. certain metals) secondary raw materials contribute between 30% and 40% of total materials demand. Even though many of these materials have end-of-life recycling rates above 50%, mostly because they are used in sufficiently large amounts in easily recoverable applications (e.g. steel in automobiles), their end-of-life recycling input rates are much lower because demand for these materials is higher than what can be provided through recycling. For most of the materials and for almost all critical raw materials however the contribution of recycled materials to raw materials demand is small to negligible. This is because their recycling is not economically viable, suitable technologies available for recycling are insufficiently developed, or because those materials are embodied in products stocked in use for long time periods (i.e., buildings or other infrastructure). In some cases this can also be explained because the demand is growing very fast, e.g. for their use in low-carbon technologies, batteries or electric or electronic devices. ·Definition: The ‘end-of-life recycling input rate’ (EOL-RIR) measures how much of the total material input into the production system comes from recycling of "old scrap" 34 .
oGiven the capital-intensity of certain recycling technologies and consequently the need to rely on economies of scale at EU level, it would not be meaningful for all materials to calculate the EOL-RIR data at Member State level. oIt is important to note that the EOL-RIR only takes into account "old scrap", i.e. scrap from end-of-life products. It does not take into account scrap that originates from manufacturing processes ("new scrap"), which is sometimes used in closed-loop industrial symbiosis processes. oThe EOL-RIR is determined by several factors. The first one is the demand for raw materials, which is increasing for almost all materials. The second one is the amount of materials that are available to be recycled. As some materials are embedded in long-life capital goods, they will only be available for recycling in the medium to long term. The indicator should also not be seen as an indicator of recycling's potential contribution to materials demand in the future. oGiven the lack of data for certain steps of the value chain, the indicator is partly based on estimates. All estimates have been peer-reviewed by the JRC and a dedicated expert group. Data source: The EOL-RIR is part of the methodology to make up the list of critical raw materials to the EU, an exercise that is carried out by the Commission every 3 years 35 . Data come from the EC Material System Analysis Study 36 and the EC Critical Raw Materials assessment. The circular economy aims at increasing the amount of material recycled and fed back into the economy, therefore reducing the generation of waste and limiting the extraction of primary raw materials. The circular material use rate (CMU) measures the contribution of recycled materials to overall materials demand. The CMU indicator is a ratio of recycled waste material over the overall material demand (operationalised by domestic material consumption plus the amount of recovered waste). It is therefore relevant for assessing the circularity of the economy. 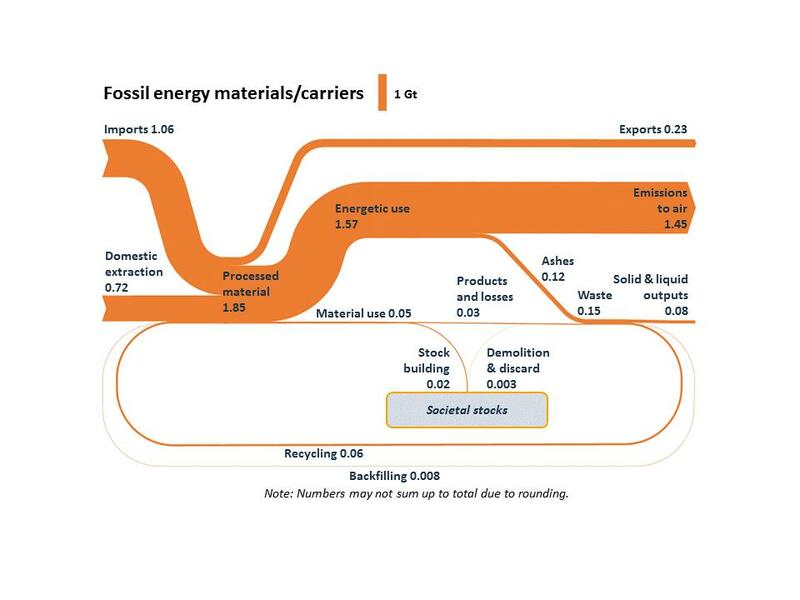 The CMU indicator also has a clear connection with the Sankey diagram of material flows, in particular the ratio between the closing loop and the materials used in the economy. The CMU indicator complements the indicator 7a End-of-life recycling input rate: where the latter focuses on specific raw materials, the former measures material flows for the whole economy and for four big groupings of materials. The CMU indicator allows comparing the EU and individual Member States, as well as analysing progress along time. According to estimates, recycled materials have contributed to 11.4% of EU materials demand in 2014. There has been a steady improvement since 2004 when the rate stood at 8.3%, with a dipping point in 2011. This was due to a peak in material consumption whilst recovered waste amounts were more or less stable. Note: CMU estimates broken down by material flow for the period before 2010 are not presently possible because of limited availability of the necessary breakdowns of waste operations data. It is possible to analyse the EU evolution between 2010 and 2014, broken down by four broad categories of materials as follows: biomass, metal ores, non-metallic minerals and fossil fuels. Between 2010 and 2014 the CMU rate increased most notably for non-metallic minerals, passing from 13.9% to 15.2%, and also for fossil energy materials from a much lower baseline of 2.1% to 2.5%. The very important category of metal ores exhibited some volatility passing from 28.0% in 2010 to 30.4% in 2012 and 28.4% in 2014, but showing overall a positive trend. Finally, the category of biomass saw a negative evolution passing from 8.9% to 8.1% over the period 2010-2014. Member States present a range of values between 26.7% and 1.4%. Highest values are recorded in the Netherlands (26.7%), Italy (18.5%) and France (17.8%). Values are lowest in Greece (1.4%), Romania (1.7%) and Ireland (1.9%). Member States with very high CMU rates have either high levels of waste recycling or low levels of domestic material consumption (DMC) or both. The Netherlands has a high percentage of waste amounts recycled, that being 26.7% (i.e. more than twice the EU28 average), in particular mineral waste from construction and demolition and animal and vegetal wastes, combined with rather low DMC (circa 10.4 tonnes per capita). Italy has an amount of waste recycled close to the EU average but an extremely low DMC (6.9 tonnes per capita). France waste recovery is around 50% higher than the EU28 average, and has more exports than imports, and a DMC value below the EU average (around 11.7 tonnes per capita). Member States with very low CMU rates have extremely low levels of waste recovery. This is the main reason for their low values of the CMU rate. 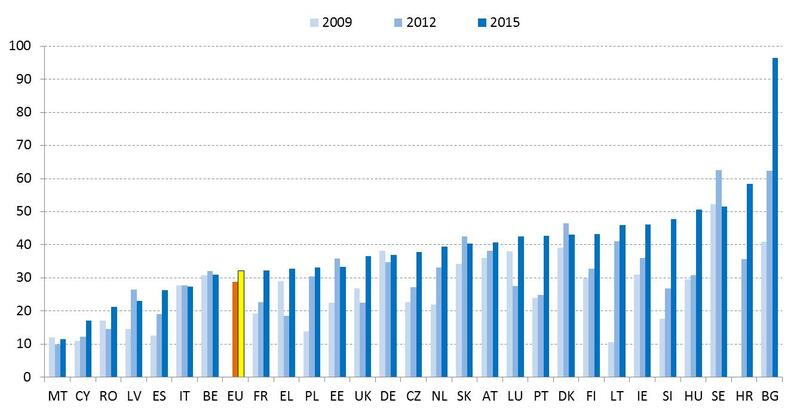 Over the period between years 2010-2014 most Member States improved their CMU as it was the case for the whole EU, which increased the CMU rate by roughly one percentage point. Some Member States where CMU decreased significantly stand out, namely Spain, Luxembourg and Finland. In all three cases reduced amounts of recovered mineral wastes determined these negative trends, reflecting a reduction in mining or construction activity. In addition, Luxembourg recovered less ferrous waste which also reduced the amounts of recovered combustion waste, reflecting a reduction in activity of the Luxembourgish construction of infrastructure. In Finland also reduced amounts of recovered wood wastes contributed to the trend in CMU. The amount of secondary raw materials (U) is approximated by the amount of waste recycled (waste treated in domestic recovery plants, minus imported waste destined for recovery, plus exported waste destined for recovery abroad). The list of imports and exports waste codes used for the indicator are found here: http://ec.europa.eu/eurostat/documents/8105938/8465062/cei_srm030_esmsip_CN-codes.pdf Waste used for energy recovery is not included in the numerator. The overall material consumption is approximated by the domestic material consumption (DMC) plus the amount of recovered waste (adjusted for imports and exports). The indicator has a possible range of values between 0 and 1, reported in percent. The indicator is calculated for all materials in the economy and also broken down by four broad groups of materials: biomass, metal ores, non-metallic minerals and fossil fuels (breakdown only available for the EU). ·Interpretation: The CMU rate indicates the amount of domestically collected waste – destined for material recovery in domestic treatment plants as well as abroad – and fed back into the economy thus saving extraction of primary raw materials. A higher rate means more circular (secondary) materials in the economy in relation to the overall material use. A higher amount of secondary materials substituting for primary raw materials avoids extraction of primary material. ·Data source: Eurostat. The numerator uses Treatment of waste by waste category, hazardousness and waste operations ( env_wastrt ) collected under Regulation (EC) No 2150/2002 , including waste amounts treated in recovery plants other than energy recovery and without backfilling (waste operation code: RCV_O). The amounts of waste treated in domestic recovery operations are corrected by net exports of waste destined for recycling sourced from Comext database . Waste statistics are available every second year but Eurostat interpolates the data to produce annual CMU estimates. The denominator uses domestic material consumption from the economy-wide material flow accounts ( env_ac_mfa ) collected under Regulation (EU) 691/2011 on European economic-environmental accounts. Efficient production of secondary raw materials through the processing of waste can be supported by a dynamic internal market and the optimal use of EU recycling capacities. Therefore it is useful to keep an overview of the trans-border movements of waste, both crossing EU borders and intra-EU trade. Many waste streams are an important source of raw materials. Therefore, in order to provide an accurate picture of the European raw materials sector and the provenance of secondary materials used by EU industries, it is fundamental to keep track of the movements of raw materials originating from waste, i.e. secondary raw materials, crossing European boundaries both as imports and exports, as well as of intra-EU trade. 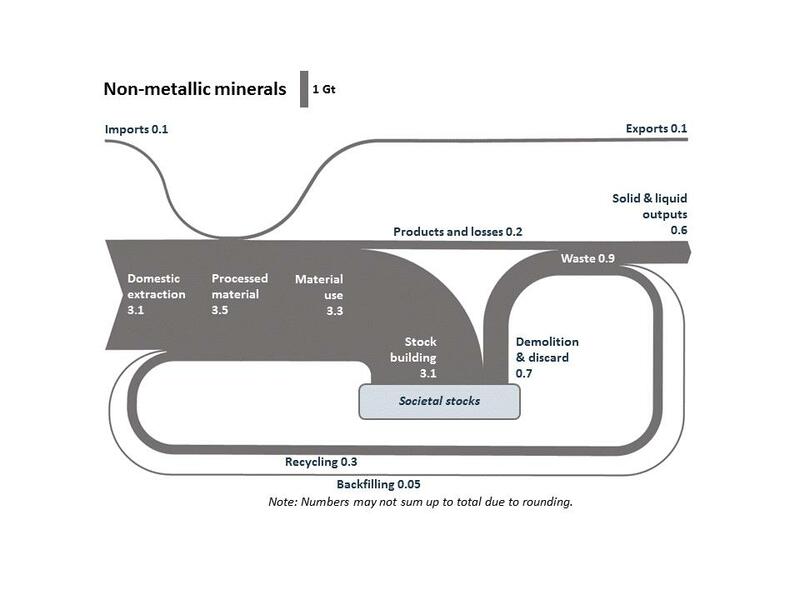 Figure 8.1: Trade of selected waste: ‘Iron and steel’, ‘Copper, aluminium and nickel’, ‘Precious metals’, ‘Paper and cardboard’, ‘Plastics’, and ‘Total’ trade of these waste 37. Figure 8.1 shows the traded flows of specific waste streams in the period 2004-2016. In 2016, the total net trades of these waste was 30 million tonnes, more than twice the net amount traded in 2004. About 18 million tonnes of ‘iron and steel’ waste were exported by the EU to the rest of the world (2016 data), while about 3 million tonnes were imported and about 27 million tonnes were traded among Member States. Between 2004 and 2016 EU exports of iron and steel waste increased by almost 50%, while imports decreased by about 60%. From 2004 to 2016, net exports of ‘paper and cardboard’ waste grew by more than 70%. The amount of paper and cardboard waste exported roughly equals the amount trade between Member States. Net exports of ‘copper, aluminium and nickel’ waste increased by more than 60%. 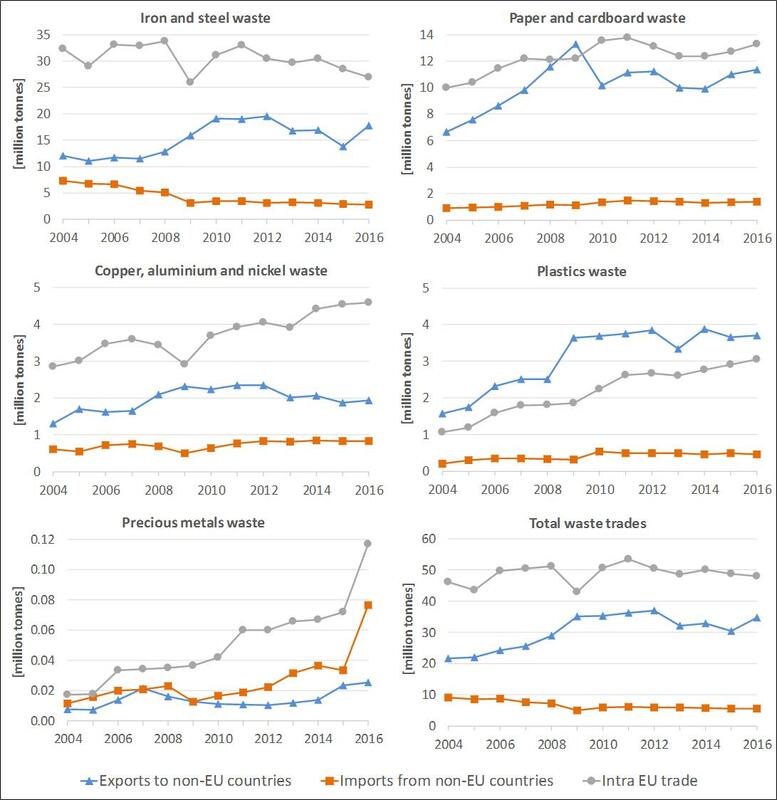 Among the waste types considered in Figure 8.1, during the period 2004-2016 the trade of plastic waste was the only one characterised by exports to non-EU countries always higher than the amount traded within the EU. In 2016, net exports of plastic waste were more than 3 million tonnes, more than double compared to the 2004. Since 2008 the EU is a net importer of ‘precious metals’ waste (i.e. imports larger than exports). From 2009, imports of ‘precious metals’ waste grew sensibly (mainly due to an increased amount of silver waste and scraps traded) and, in particular, from 2015 to 2016, imports doubled. ·Definition: Volumes of selected wastes and by products that are shipped across intra- and extra EU borders. The imports and exports codes determining the scope of waste selected for the indicator are found here: http://ec.europa.eu/eurostat/documents/8105938/8465062/cei_srm020_esmsip_CN-codes.pdf . ·Interpretation: The indicator provides an accurate picture on the trade flows of a number of waste streams that could be recycled into secondary raw materials. It is noted though that this indicator only covers the legal exports of waste materials. Due to their nature, illegal waste shipments are not tracked in official reporting systems. There is however extensive evidence that the amount of illegally exported waste is significant, and, for some categories of waste such as end-of-life vehicles or WEEE, perhaps even higher than the amount of legal exports. ·Data source: Eurostat. Comext database for imports and exports from Foreign Trade Statistics. Innovation and investments (on eco-design, on secondary raw materials, on recycling processes and on industrial symbiosis) are a key element of the transition to a circular economy. The circular economy can make a significant contribution to the creation of jobs and economic growth. Looking at jobs and growth of relevant sectors indicates whether the transition to a circular economy is delivering the expected results. Sectors that are closely related to the circular economy such as the recycling, repair and reuse, are particularly job intensive, and contribute to local employment. It is important to note that the sectors analysed here only represent a subset of a much wider economic impact of the circular economy. However, the impact of the circular economy in other sectors is more diffuse, and difficult to isolate. Recycling as well as repair and reuse are considered good proxies for the mainstreaming of the circular economy in other sectors. Annex 3 includes the list of NACE codes used for defining the circular economy sectors. Note: Confidential or not reliable data for Czech Republic, Ireland, Luxembourg and Malta. In absence of 2008 data the following are shown: Belgium, France the Netherlands and Slovenia (2009), Bulgaria and Croatia (2010), Greece (2011). United Kingdom only 2015 available. In absence of 2015 data the following are shown: Estonia and Slovenia (2011). In 2014 the private investments in circular economy sectors in the EU were estimated to be around 15 billion Euro (i.e. 0.1% GDP), an increase by 3% compared 2013. The share of private investment in the circular economy sectors differ a lot among the Member States, ranging from 0.04% in Greece to 0.27% in Latvia. After Latvia, the highest share of investments in circular economy sectors compared to GDP are found in Estonia (0.25%) and Slovakia (0.21%). Seven Member States (Belgium, Croatia, the United Kingdom, Bulgaria, Poland, Slovenia and Romania) have a share between 0.15% and 0.2%. The Member States which have increased private investment in circular economy the most over the period 2008-2015 are Hungary (+40%), France (+33%) and Germany (+26%), in absolute terms. The share of the investments compared to GDP has increased by 40% in Hungary. During this period the investments were cut considerably in most Member States. ·Definition: The indicator measures gross investment in tangible goods in the recycling sector; repair and reuse sector. Gross investment in tangible goods is defined as investment during the reference year in all tangible goods. Included are new and existing tangible capital goods, whether bought from third parties or produced for own use (i.e. capitalised production of tangible capital goods), having a useful life of more than one year including non-produced tangible goods such as land. Investments in intangible and financial assets are excluded. Repair and reuse sector and rental and leasing sector are defined and approximated in terms of economic activities in the NACE classification. The denominator is expressed as Gross Domestic Product at market prices of the current year. ·Interpretation: Figure 9.1 reports gross investments as a percentage of GDP to allow comparing data in time and across Member States. In absence of 2008 data, 2009 data are shown for Belgium, 2010 data for France; 2011 data for Greece; 2012 for EU. 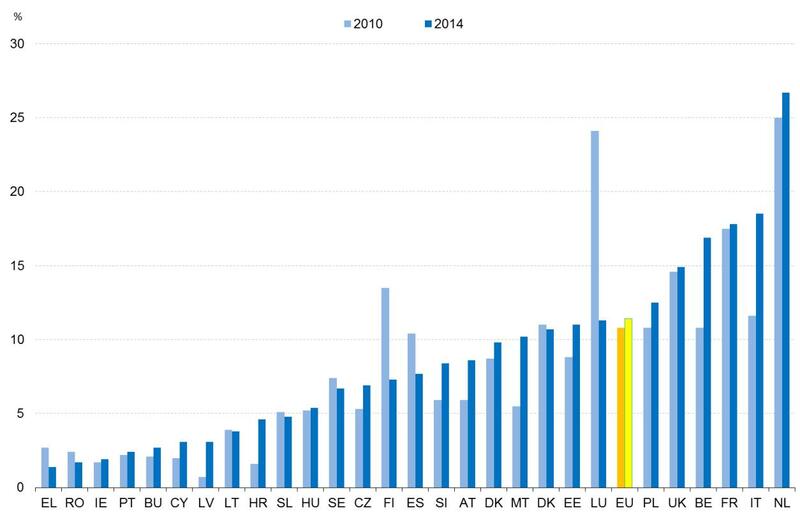 In absence of 2015 data, 2014 data are shown for EU. In 2014 there were almost 3.9 million persons employed in circular economy sectors in the EU (i.e. 1.7% of all the employed persons). This is a growth of around 2% compared to 2012. Employment in the circular economy has increased in most Member States, both in absolute and relative terms, during the period 2008-2015, despite the financial and economic crises. Lithuania and Latvia have the highest share, with more than 2.5% of employed persons in circular economy. However, in absolute terms, Germany has the highest number of persons employed in circular economy (more than 616 000 persons), followed by Italy and the United Kingdom (around 500 000 persons each one). According to the available data, employment in circular economy sectors increased in particular in Slovakia (by 53%, as share of the total persons employed), Spain and Germany (by around 25% both). ·Definition: Number of persons employed is defined as the total number of persons who work in the observation unit, i.e. the firm (inclusive of working proprietors, partners working regularly in the unit and unpaid family workers), as well as persons who work outside the unit who belong to it and are paid by it (e.g. sales representatives, delivery personnel, repair and maintenance teams). It excludes manpower supplied to the unit by other enterprises, persons carrying out repair and maintenance work in the enquiry unit on behalf of other enterprises, as well as those on compulsory military service. Same scope of repair and reuse sector as for indicator 9a. ·Interpretation: The indicator is expressed as percentage of overall employment, to allow comparing Member States. ·Data source: Eurostat. Structural business statistics (SBS). Annual detailed enterprise statistics for industry (NACE Rev. 2, B-E) (sbs_na_ind_r2) , Annual detailed enterprise statistics for trade (NACE Rev. 2 G) (sbs_na_dt_r2) , Annual detailed enterprise statistics for services (NACE Rev. 2 H-N and S95) (sbs_na_1a_se_r2) , collected under the Regulation on Structural Business Statistics 39 . For the denominator: Population and employment ( nama_10_pe ) (national accounts employment estimates). In absence of 2008 data, 2009 data are shown for Belgium, France and the Netherlands 2010 data are shown for Croatia; 2011 data are shown for Germany and Greece; 2012 for the EU. In absence of 2015 data, 2014 data are shown for the EU; 2011 data are shown for Estonia. In 2014 the circular economy sectors generated a gross value added of around 141 billion EUR in the EU (i.e. around 1% of the overall GDP in the EU). The gross added value in the circular economy sectors increased by around 6% in the EU during 2012-2014, and it slightly increased (by 2%) as a share of the EU GDP. Over 2008-2015 the gross added value in circular economy sectors has increased by 46% in the United Kingdom, and by almost 30% in Austria.. Slovenia has the highest increase of the gross added value in circular economy sectors (as GDP share) being more than 19%, and it is followed by Finland, Austria and the United Kingdom (increase of the share by more than 10%). ·Definition: Value added at factor costs is the gross income from operating activities after adjusting for operating subsidies and indirect taxes. It can be calculated as the sum of turnover, capitalized production, other operating income, increases minus decreases of stocks, and deducting the following items: purchases of goods and services, other taxes on products which are linked to turnover but not deductible, duties and taxes linked to production. Value adjustments (such as depreciation) are not subtracted. Same scope of repair and reuse sector as for indicator 9a. ·Interpretation: Figure 9.3 presents gross value added as percentage of GDP as to allow comparison of the Member States. Innovation plays a key role in the transition towards a circular economy, creating new technologies, processes, services and business models. The development of innovative technologies for waste management and recycling will support the competitiveness of the EU industry. Patent statistics are a proxy to assess technological progress and innovation. The number of patent applications is also used as an indicator in the Raw Materials Scoreboard 2016. 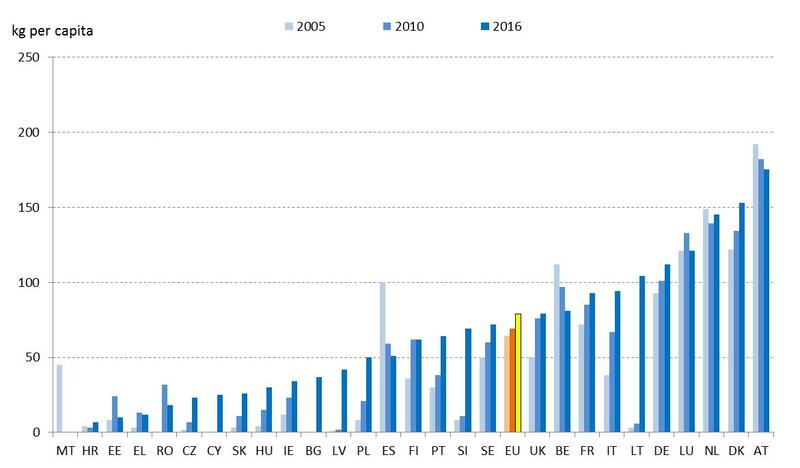 In the EU, the total number of patents related to recycling and secondary raw materials has increased from 270 to 364 (+ 35%) between 2000 and 2013. (Fig. 10.1). 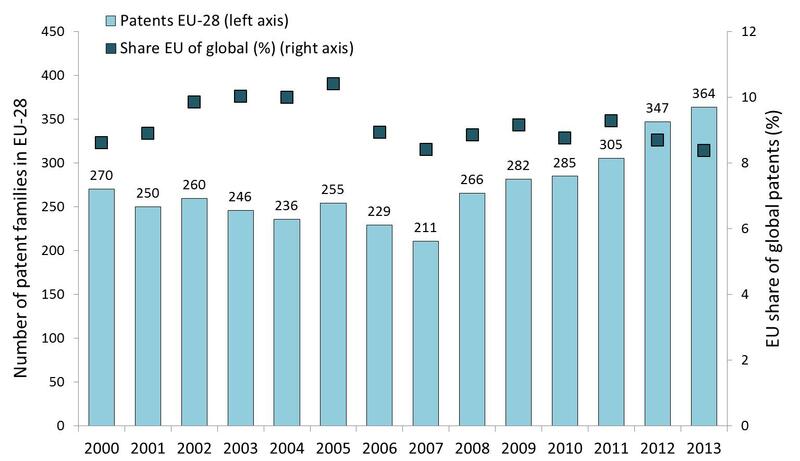 The EU share of the global patents varied between 8.3% and 10.4% during this period, with a peak in 2005. In the EU in 2013, the largest number of patents per million inhabitants came from Luxembourg, followed by Finland, Latvia, Denmark, Belgium, Austria and Germany (Fig. 10.2). 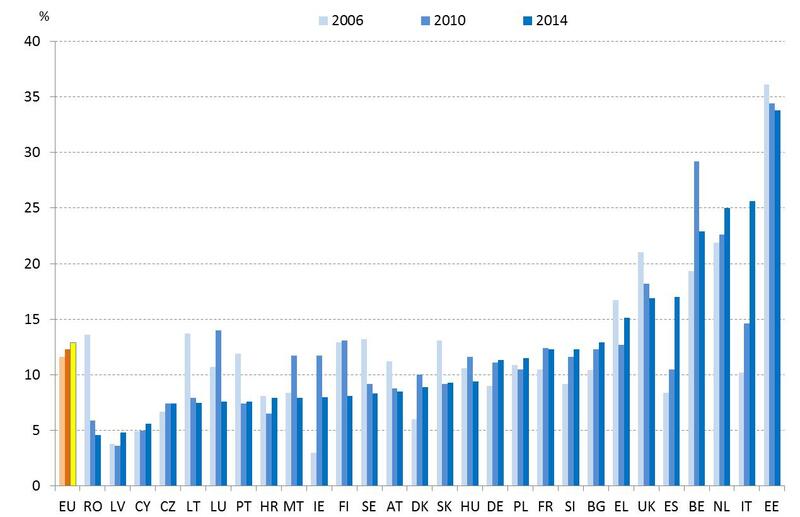 Between 2000 and 2013 the number of patents per million inhabitants increased in all Member States, with the exception of Bulgaria, Germany, Ireland, Lithuania and Slovakia. Considering 12 selected technologies of particular relevance (Fig. 10.3), it can be seen that in 2013, the biggest number of patents registered by European applicants concerned plastic recycling (about 42 inventions), or 44% of the global total, followed by paper recycling (about 19 inventions) and bio-organic fraction processing (about 18 inventions). Additionally, about one fourth of all global patents for paper recycling and rubber waste recycling technologies were registered by EU applicants. The respective EU share for the recycling of plastics was 18% (Fig. 10.3). In 2013, the lowest EU share of patents among the selected technologies was for metal recycling and bio-organic processing (production of fertilisers from the organic fraction of waste or refuse); only 2.5% of the global number of patents associated with recycling of metals and of the ones associated with bio-organic processing was registered by applicants located in EU. Definition: The term 'patents' refers to patent families, which include all documents relevant to a distinct invention (e.g. applications to multiple authorities), thus preventing multiple counting. A fraction of the family is allocated to each applicant and relevant technology. The attribution of patents to recycling and secondary raw materials was done using the relevant codes in the Cooperative Patent Classification (CPC) 41 . §The number of patent families in 2013 for 12 selected technologies relevant to recycling of different materials, waste collection, transportation, storage, dismantling and waste processing. ·Interpretation of the indicator: Whereas the indicator provides insight into the most relevant innovative recycling technologies, it does not cover all technologies related to waste management, nor other services and business models of the circular economy. It also needs to be noted that not all relevant innovations are or can be patented. ·Data source: JRC assessment of PATSTAT data. Data were extracted from the Spring 2017 PATSTAT edition, the Worldwide Patent Statistical Database created and maintained by the European Patent Office (EPO) and processed using a JRC in-house methodology 42 . There is a 3.5-year delay in the data processing cycle, meaning that the latest year for which complete data is available presently is 2013. The recycling technologies are selected from the section dedicated to waste management (i.e. Y02W) of the CPC scheme. The CPC codes used in this indicator are shown in Annex 4. Annex 3 - List of NACE codes for the indicator "Private investments, jobs and gross value added related to circular economy sectors"
The Sankey diagrams for material flows are based on the law of conservation of mass, which means that flows for which there are no reported Eurostat data are modelled based on recent scientific publications to compensate differences in reported input and output flows. As a consequence for some material flows there are considerable uncertainties in the results presented. Nonetheless, the authors conclude that the data reliability is sufficient to provide a rough but comprehensive assessment of the circularity of the economy at the level of material groups. Due to the assumptions made, it is generally considered that the model overestimates the circular use of materials in the EU economy. The European Commission Joint Research Centre together with the Institute of Social Ecology in Vienna (Alpen Adria University) carried out a study to update the Sankey diagram on material flows in the EU-28 that was included in the 2016 Raw Materials Scoreboard (Indicator 15). This updated Sankey diagram combines Eurostat economy-wide material flow accounts (EW-MFA) and waste statistics for 2014 with additional data collection and research. A scientific article is currently under preparation and will shortly be submitted for publication 44 . The Sankey diagram systematically uses the latest available Eurostat data from EW-MFA 45 for raw materials inputs from domestic extraction and imports, and to capture exports to non-EU countries. The allocation of material flows into the different material categories and the split between energetic and material use are based on recent scientific publications 46 . Conversion factors to calculate the amount of metal vs. extractive waste are based on Eurostat 47 . Additional research and literature studies were undertaken, e.g., to determine the fraction of crude oil and natural gas used for material purposes (e.g., plastics, lubricants, tyres), or to determine the share of materials used in short-lived vs. long-lived products. Eurostat waste treatment statistics 48 are used and, where necessary, are complemented to model the amounts of waste at end-of-life (EoL), recycling and backfilling flows, and waste crossing into nature. Because the waste flows are reported using different classifications than the EW-MFA, waste flows were reallocated to match the material flow accounts (material categories) using a mix of information, e.g., from the scientific literature and expert judgements. A further distinction between wastes originating from material or energetic uses is made. Selected modifications are made, e.g., to adjust the water contents in flows of sludge and effluents. The Sankey model is based on the law of conservation of mass. It combines reported input and output data from the Eurostat statistics, and models flows which are not reported in official statistics to balance differences in reported input and output flows. Estimates of the annual material stock additions and the fraction of demolition and discard flows from societal stocks to EoL waste management are based on stocking rates reported in the scientific literature 49 50 . 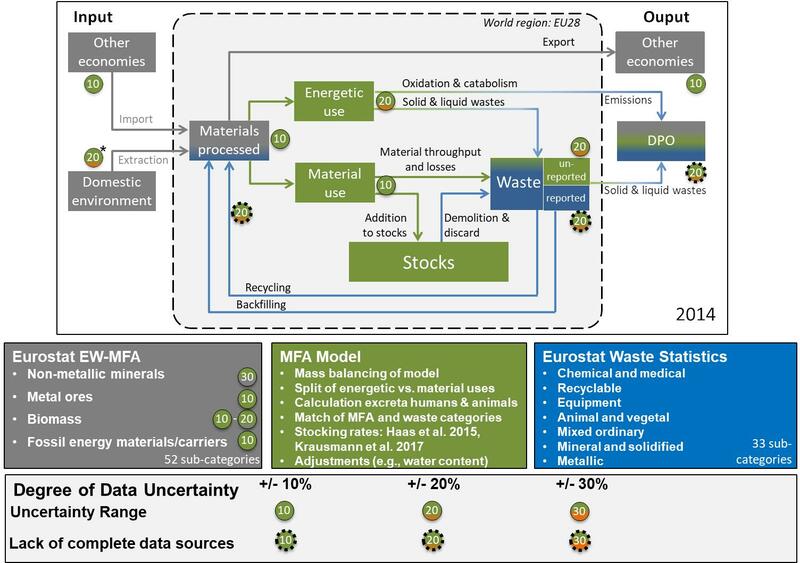 Figure 15.4 presents an overview of the different data points for material flows through the EU28 indicating some of the data sources used and an assessment of the degree of uncertainty of the diagram's different components. Grey and blue boxes indicate flows that are based on Eurostat statistics, while green boxes represent estimates based on the MFA model developed. The numbers included in the small circles further present an assessment of the degree of data uncertainty (i.e., the best estimate ± uncertainty range) and the lack of completeness of data sources. These uncertainties in material flow data were classified using expert judgements and the scientific literature 51 52 and range from ±10% (lower uncertainty), ±20% (medium uncertainty), to ±30% (higher uncertainty). Figure 15.4: Data and sources for assessing the circularity of the EU28-economy, including estimates of uncertainty ranges and completeness of data sources. *Uncertainty ranges between 10-30%. For some material groups, such as many metals, fossil energy carriers, and biomass, a broad knowledge of the material system and solid data exist. For other materials the data situation is less satisfying and the level of uncertainty is considerable, in particular for recycling rates and flows of non-metallic minerals (i.e. construction minerals). Data on stocks, addition to stocks, and the separation between energetic and material use, which are not reported by Eurostat material flow statistics, are estimated based on available information gathered in a broad literature survey. Flows that are not reported but estimated, e.g. for the biomass category (by-products and residues as well as biomass grazed by ruminant livestock) and industrial & construction minerals (bulk mineral flows), are acknowledged to add uncertainty to the model. Further, in relation to waste flows, there are three issues that cause a certain level of uncertainty. First, Eurostat waste statistics, which are collected based on the Waste Statistics Regulation, do not comprise all flows that are included on the input side (EW-MFA). In order to balance this lack of completeness, these flows are estimated and included under the category “un-reported waste flows”. These flows are mainly from agriculture, comprise largely biomass, and have consequently the same degree of uncertainty as the biomass input data (i.e. 20%). More specifically, these are excretions of humans and livestock which can be modelled but which are only reported to a very limited degree. The second source of uncertainty is related to the right allocation of waste flows to the different environmental media. The outflows into the environment are a matter of simplification. In the modelling, they are treated as if they all sooner or later disperse as solid or liquid waste into the environment (e.g. via leachate). In reality, landfills and incineration plants divert a large share into emissions to air. According to expert assessments, medium uncertainty is assigned to these flows. A third source of uncertainty is related to recycling itself. While data on recovered flows are more or less reliable, it remains uncertain to a higher degree, how much of the recovered materials become secondary material to replace primary raw materials, how much consists of downcycling 53 54 , and how much become losses during the preparation phase. In sum it is acknowledged that there are considerable uncertainties in the results presented. Nonetheless, the authors conclude that the data reliability is sufficient to provide a rough but comprehensive assessment of the circularity of the economy at the level of material groups. Due to the assumptions made, it is generally considered that the model overestimates the circular use of materials in the EU economy. List of NACE codes for the indicator "Private investments, jobs and gross value added related to circular economy sectors"
In bold are the patent codes of the 12 technologies selected in Fig. 10.3. These have been published in a scientific article from Haas W., Krausmann F., Wiedenhofer D. and Heinz M. in 2015, with the aim of providing a rough but comprehensive assessment of the circularity of an economy at the level of material groups. Renting and leasing arrangements can contribute to circular economy, but have for now been excluded because current statistics may not distinguish with sufficient granularity those transactions that clearly contribute to circular economy and those that do not. Critical raw materials are raw materials of high importance to the EU economy which have a high risk associated with their supply. See also the Raw Materials Scoreboard , indicator 3 on share of imports. Data were presented to experts for peer-review in a dedicated expert group of the Raw Materials Supply Group – Ad hoc Working Group (AHWG) on defining critical raw materials. Three stakeholder validation workshops, involving the AHWG and other relevant experts took place on 25, 28 October and 7 November 2016 with the aim to review the data used for the purpose of criticality calculations. The new standard form should be approved as an implementing regulation by the Advisory Committee on Public Procurement. Gross Domestic Product (GDP) is the most common measure of the size of an economy: it includes the total market value of all goods and services produced within a country in a year. Almost two thirds (64 % or 3.2 tonnes per inhabitant) of the total waste generated in the EU-28 in 2014 was major mineral wastes. In some EU Member States, having relatively sizeable mining and quarrying activities and/or construction and demolition activities, major mineral wastes accounted 85 % or more of all waste generated. It accounts for less than 20% in others. Food Use for Social Innovation by Optimising Waste Prevention Strategies (FUSIONS) project. Report on the proposal for a Directive amending Directive 2008/98/EC on waste (COM/2015/0595 final) http://www.europarl.europa.eu/sides/getDoc.do?pubRef=-//EP//TEXT+REPORT+A8-2017-0034+0+DOC+XML+V0//EN . Obligation of regular monitoring in all EU Member States is included in the Commission Proposal amending Waste Framework Directive. Several Member States conduct monitoring on national level; however these efforts are not yet harmonised at EU level. It is expected that the amended Directive will be adopted in early 2018, which would allow adoption of the methodology in the following year and selecting 2020 as the first reporting year. Regulation (EC) No 2150/2002 on waste statistics. WEEE means electrical or electronic equipment which is waste within the meaning of Article 3(1) of Directive 2008/98/EC, including all components, sub-assemblies and consumables which are part of the product at the time of discarding. EEE means equipment which is dependent on electric currents or electromagnetic fields in order to work properly and equipment for the generation, transfer and measurement of such currents and fields and designed for use with a voltage rating not exceeding 1 000 volts for alternating current and 1 500 volts for direct current. “backfilling' means a recovery operation where suitable waste is used for reclamation purposes in excavated areas or for engineering purposes in landscaping and where the waste is a substitute for non-waste materials”. This could happen for instance in cases where constructions materials are reprocessed to comply with certain specifications and are used in building or infrastructure foundation. Elements in white indicate that no data or estimates are available from the 2017 EU criticality assessment. Source: JRC elaboration based on the EC list of Critical Raw Materials (2017). Source: JRC elaboration based on Eurostat data (Comext). This annex is a summary of the methodology for the Sankey diagram of material flows in Figure 1. It presents the methods and assumptions made by the authors of the Sankey. The opinions in this text are those of the authors of the Sankey diagram and not those of the European Commission. Haas W. et al., 2015. ‘How Circular is the Global Economy? An Assessment of Material Flows, Waste Production, and Recycling in the European Union and the World in 2005’, Journal of Industrial Ecology, 19(5) (pp. 765-777). 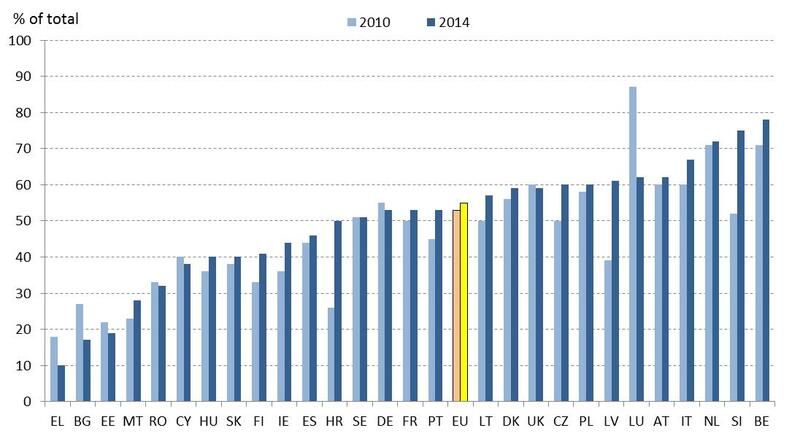 Eurostat 2013. ‘Economy-wide material flow accounts (EW-MFA) Compilation Guide 2013’. Krausmann, F. et al. 2017. ‘Global socioeconomic material stocks rise 23-fold over the 20th century and require half of annual resource use’. Proceedings of the National Academy of Sciences 114(8) (pp. 1880–1885). ‘Downcycling’ refers to reprocessing, where the new product from these recycled materials has a lower material quality than the original product (e.g., plastic bottles become street boundary posts).